The mustang horses for sale grew popular in North America after Spanish explorers introduced them in the 1500s. Although, the population of mustangs decreased drastically after the Anglo explorers arrived in the 1800s. Mustangs were still being over hunted and nearly became extinct in the 1960s. In 1971, the mustang gained federal protection under the Wild Free-Roaming Horse and Burro Act. That act outlawed hunting, capturing, and branding any kind of wild horse in the United States. This law has been removed since then and mustangs are no longer protected. Mustang breeds usually live in herds that consist of one male and eight females with a number of foals. At age two, male foals will be driven away by the males. Each mustang herd will inhabit its own territory! The mustang develops a low-nutrition diet made up of juniper plants, sagebrush, and coarse grasses. They have learned to survive because they know to dig around water holes and smash frozen streams for water. Mustangs breed between April and July. Pregnant mares then leave the herd to find a closed and safe place to give birth to the foal that next Spring. Mustangs can be a variety of colors such as; brown, bay, black, and gray. They are usually between 13 and 15 hands tall. 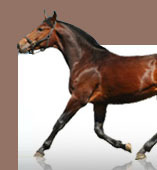 This breed of horse is very gentle and are highly intelligent!